I’ve always wanted to create these classic couple costumes. 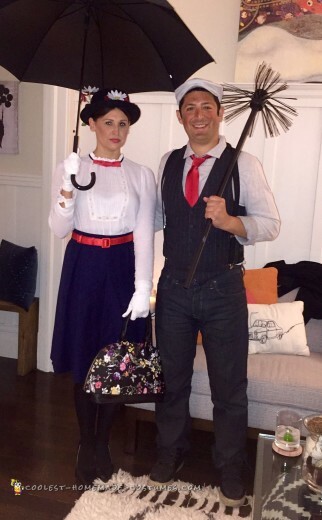 I grew up watching the movie Mary Poppins and I loved the characters and the costumes. This Halloween, my boyfriend and I decided to create homemade costumes for Mary Poppins and Bert (the chimney sweep from Mary Poppins). I pieced my costume together with clothing and accessories I found and purchased online. This included the navy blue wool skirt, white blouse, black tights, black leather pumps, red satin belt, white cotton gloves, black wool hat, and red bow tie. I attached the bow tie to the blouse. Then, I hot glued a few red plastic cherries, some leaves, and white and red little flowers to the hat. I topped the look off with a large black umbrella, of course. We had so much fun putting these homemade couple costumes together that we ended up wearing them twice. The couple costumes were a hit and we ended up entering and winning the costume contest at the Halloween party we went to (at a bar in San Francisco)! Unfortunately they didn’t give out any prizes for our couple costumes, even for winning first place! :-/ But at least we won some bragging rights for the night. :) I was also nominated in my office costume contest (out of an office of basically a thousand people). While I did not win that one, I did make it into the finals! Homemade costume idea posted by Jessica R.